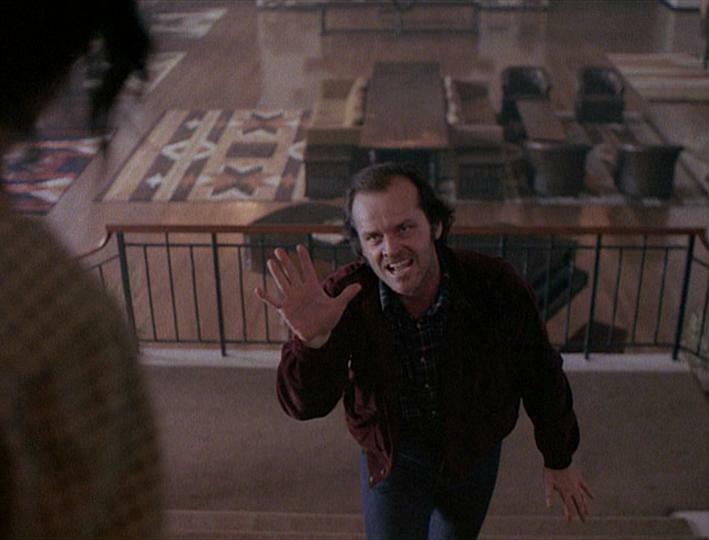 Jack Torrance (Jack Nicholson) takes a job as caretaker of the Overlook Hotel for the winter. A struggling alcoholic who has been sober for five months, he plans to work on his latest “writing project,” while his wife, Wendy (Shelley Duvall), and son, Danny (Danny Lloyd), stay with him in the enormous hotel. Before the employees leave, a cook, Hallorann (Scatman Crothers), recognizes in Danny a shared extrasensory ability. Hallorann’s grandmother referred to ESP as “shining,” which the young boy handles by creating Tony, who lives in Danny’s mouth, talking to him and sometimes showing him pieces of future events. Danny can sense that the cook is afraid of Room 237, and Hallorann warns Danny to stay out of the room. Jack had been informed by the hotel manager of the preceding caretaker, Charles Grady, who murdered his family with an axe before killing himself. Days pass, and Jack sleeps late, repeatedly tosses a ball against the wall, and nods off at the typewriter. As Jack’s behavior becomes progressively more antagonistic towards his wife and son, Danny has visions of mysterious sisters, bloody corridors, and the word “redrum” scrawled on a door. Soon, Jack is seeing people at the hotel, like the bartender, Lloyd, who serves him drinks, and it seems only a matter of time before the agitated writer picks up an axe. Stanley Kubrick’s The Shining was not generally well received upon its 1980 release in theaters, but like several of Kubrick’s films, The Shining has, over time, garnered more fans and favorable reviews. Kubrick was well known for his rigorous shoots during production, a perfectionist for every shot of his films. His movie prior to The Shining, Barry Lyndon (1975), took an astounding 300 days to complete filming, whereas production for The Shining reportedly lasted over a year. Perhaps because of his lengthy shoots, Kubrick was never genuinely considered an “actor’s director,” as the actors sometimes were simply objects within a highly detailed construct (e.g., the privates standing at attention in 1987’s Full Metal Jacket or Alex and his droogs sitting at the milk bar in 1971’s A Clockwork Orange). In The Shining, there are seemingly endless shots of far-reaching hallways and characters framed in vast, nearly empty rooms. Something as simple as Wendy bringing Jack his breakfast becomes an arduous task of rolling a service cart for a prolonged distance. Many horror films enclose characters within confined spaces (such as George A. Romero’s 1968 ghoul opus, Night of the Living Dead), but The Shining takes an alternate approach. There is plenty of room to move in the colossal hotel, but, like with so many of the hotel’s elements, it’s pure deceit. The isolated hotel is covered in a severe snow storm, so Danny and his mother can run, and they can even hide, but there truly is no escape. 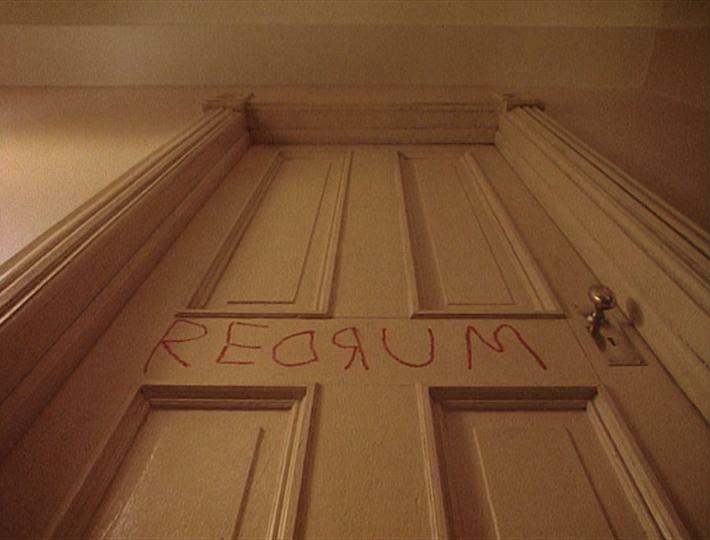 There have been numerous readings of The Shining, with some critical writings or essays viewing the film as an allegory. While a literal translation of the film’s plot is not likely feasible, it is possible to focus more on its base components. Jack Torrance is either conversing with and being manipulated by ghosts or his mind is disintegrating (not unlike Jack Clayton’s 1961 The Innocents or its source text, Henry James’ The Turn of the Screw). 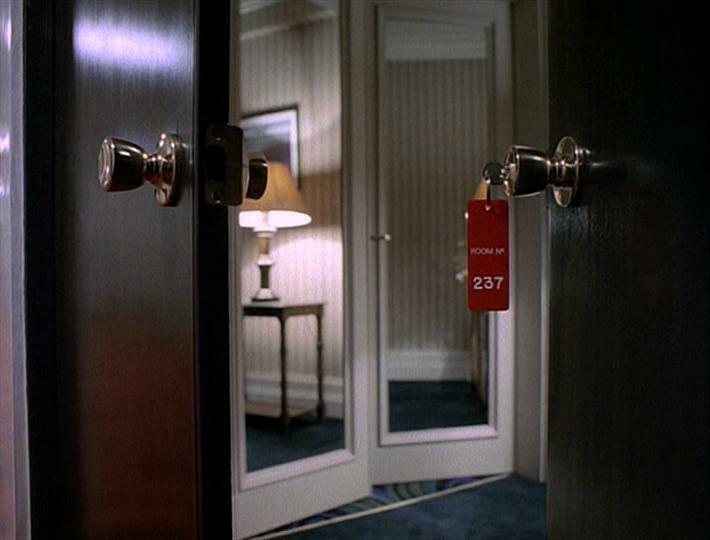 Theories can support either belief, but Kubrick’s infamous concluding shot, closing in on a simple photograph, adds a new element to any potential interpretation. The film’s Steadicam operator, Garrett Brown, invented the Steadicam, which he initially called the “Brown stabilizer.” He first utilized the Steadicam in Bound for Glory (1976) and won great acclaim for Rocky the same year, following Sylvester Stallone up the steps of the Philadelphia Art Museum. His design originally covered the area from the operator’s waist to head, but he was able to employ shots in The Shining at knee height (accomplished by utilizing a wheelchair), as the camera travels behind Danny on a Big Wheel in the Overlook’s hallways. The tracking shots in Kubrick’s film are extraordinary. They are fluid and follow Danny so closely that it gives the impression of being pulled against one’s will, intensifying the dread of the boy turning a corner, as one can never tell what will be standing there. Soon after its initial theatrical release, Kubrick pulled the film and cut the ending. The final shot was the same, but there was a preceding scene that did little to explain the events of the movie. If anything, it unnecessarily piled on further intricacies to a labyrinth of ideas. There are apparently production shots, but the filmed scene reportedly no longer exists. Wendy Carlos and Rachel Elkind composed a score for the film (Carlos had also written the Moog synthesizer music for Kubrick’s A Clockwork Orange). However, very little of their music was used, as Kubrick opted for already existing classical music to cover most of the film’s soundtrack. In 2005, Carlos released the original material written for The Shining, with Rediscovering Lost Scores, Vol. 1 and 2 (also featuring selections from A Clockwork Orange and 1982’s Tron). 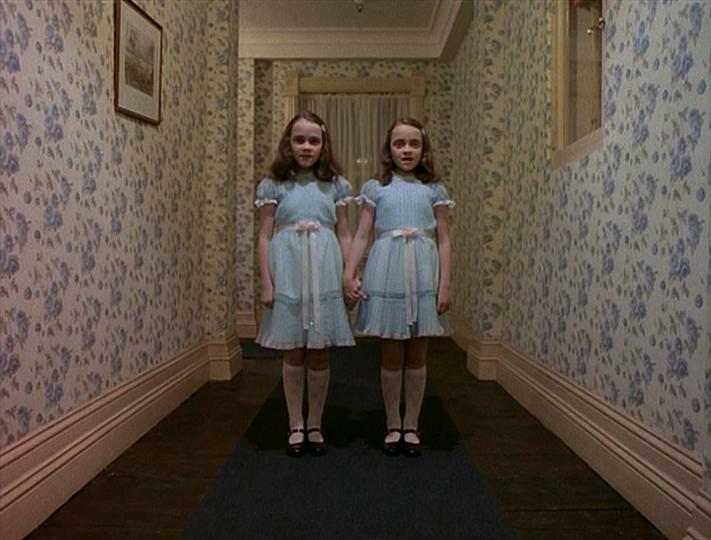 Though they are often referred to as “twins,” the ghostly Grady sisters in The Shining are simply dressed alike, as the film explains that the two girls are different ages. The well known line -- “Here’s Johnny!” -- was an ad-lib by Nicholson. Clearly a play on Ed McMahon’s introduction of Johnny Carson on The Tonight Show, Stanley Kubrick, who had been living in England for a number of years, reportedly did not comprehend the reference. 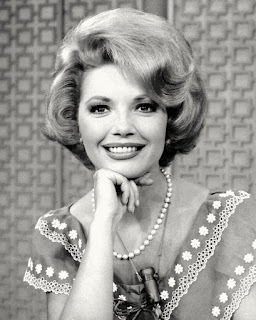 Carson would later incorporate the scene in an introduction to one of the show’s anniversary specials. The Shining is one of my favorite horror films. I’m a Kubrick fan, and although he didn’t concentrate on the horror genre, the famed director was able to create scenes of sheer intensity and disturbing imagery that sears itself into the viewers’ minds. It’s a movie that, if nothing else, makes me glad that I cannot afford to stay at a gigantic posh hotel. 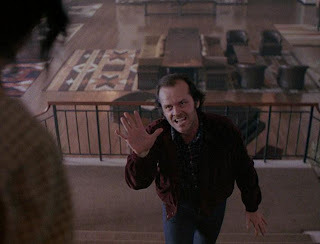 Sark, I can think of criticisms and faux pas regarding The Shining....and yet....this movie is one of the best. It scared me in a lasting way because of the techniques Kubrick used, the long slow shots, the camera angles, everything you discussed. 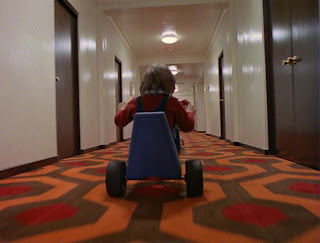 Riding with Danny around those hallways was terrifying, and the two little girls haunt my dreams to this day. Lloyd the bartender and his distinctive way of speaking, that scene in the art deco men's room with Grady, quiet, slow, with Grady's way of speaking, incredible. Kubrick's way of pulling a scene out in those lengthy ways was the whole point of building terror. Yes, I think Nicholson went over the top, but that was Kubrick's fault as director. Nicholson is a fabulous actor, but needs to be reined in, and Kubrick didn't do it enough. Yes, I think Shelley Duvall was not good casting -- she was too whiny and annoying for me. The little boy was just wonderful. No, it did not follow King's book which might normally bother me. But none of that matters -- this is one of the most terrifying movies I ever experienced. 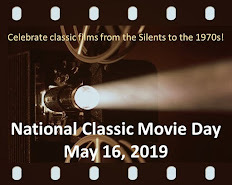 The decision to use the classical music was the right one, and the black-outs between scenes with that thunderous sound was inspired. 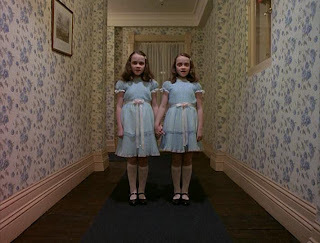 I'm with you -- Kubrick was a genius, and he made The Shining one of the best horror films ever made. Really good article, Sark, full of interesting behind-the-scenes info, and the perfect way to end the Cafe's Halloween marathon. Kudos! Sark, all your reviews for the Cafe's "13 Days of Halloween" have been extraordinary and your review for THE SHINING is no exception. It's clear that you love the horror genre and have studied it. Your latest critique has me considering watching THE SHINING again. That is no easy accomplishment because I have seen it once (when it was released) and didn't care for it. Like several of Kubrick's films, I admired its technical merits, but it didn't appeal to me on an emotional level. As King feared, I felt that Nicholson's broad performance removed a lot of potential ambiguity and I am not a fan of Shelley Duvall's trademark quirkiness. On the other hand, the film's setting--and Kubrick's visualization of it--are incredibly chilling. No one has made a near-empty hotel more threatening and your descriptions of Kubrick's tracking shots and use of empty space have renewed my interest in the film (by the way, as I often say, your selection of photos to enhance your review are excellent). It was interesting to learn that Kubrick jettisoned the original soundtrack, as music and songs are typically integral to his films. For the record, my favorite Kubrick film may be the atypical SPARTACUS, which he took over when Kirk Douglas fired Anthony Mann. It's a perfect blend of love story, political drama, and action spectacle. Sark, you really like horror films. This version is much better than the tv remake. I can see why King had a problem with Nicholson, though...he just projects crazy in everything. Great way to end our Halloween marathon. Sark, I always enjoy reading your awesome movie reviews. I have seen this horror film. I have to say there some really haunting beautiful scenes showcased throughout the movie. Also, The Shining, is as scary as horror gets, never letting you catch your breath. Especally... in the last half hour. Sark, this is an interesting movie. It has some creepy scenes. I read and loved King's book. I was disappointed in the film. I thought the book was one of King's finest. I was disappointed with this movie because the book had more chilling scenes. The book left no doubt to me that Torrance was seeing ghosts. I must admit that Nicholson's and Duvall's performance rather got on my nerves. They were poorly cast as the characters. I can see why King was disappointed in the way this film presented his story. However, I didn't care for the miniseries either. Many of King's books aren't presented well in film like Salem's Lot, It, and several others. I think the best film based on his books was Misery. Kubrick is a fine director and the film has some outstanding moments. If you haven't read the book, it is truly better than this movie. Enjoyed reading your well researched article though. I was disappointed when I saw "The Shining" in the theater in 1980. I went with great anticipation, expecting a superb horror film from a great director. On that viewing, my thought was that if it had been made by any other director I might have liked it more- but I expected a masterpiece from Kubrick. On seeing the film again recently, I have revised my opinion. It is a better film than I remembered, though I also objected to Nicholson's over-the-top performance. Nevertheless, Kubrick created what I consider the first element of a horror film: an atmosphere of dread. I have since added the film to my collection.